Special occasions call for fancy snacks. So we’ve taken our all-time favorite snack—pizza—and made it pretty and seasonal. 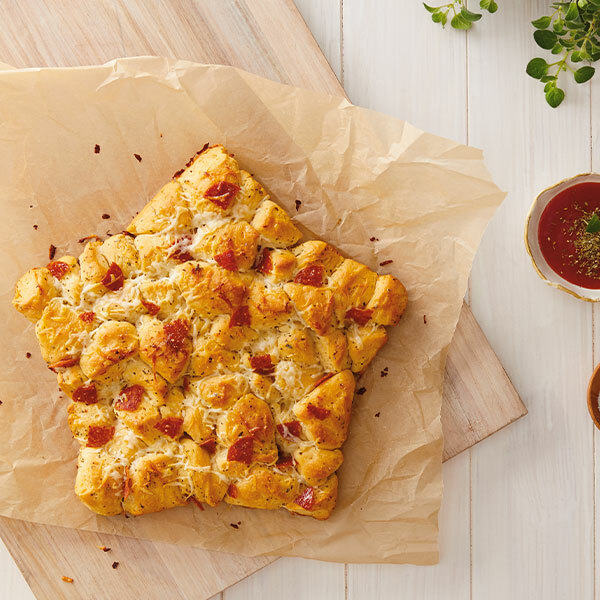 Our Pull-Apart Pizza Bread is baked in a star-shaped baking pan to make it festive, but you can use a round one or a square one or one shaped like a bear, if you want. We’ve used refrigerated biscuit dough and shredded mozzarella to keep things simple—just add olive oil, pepperoni, and some Italian seasoning, and some marinara sauce on the side for dipping. Pinkies up, though. Remember the fancy. Preheat oven to 375 degrees. Oil the sides of the pan with some of the olive oil. Set aside. Slice each biscuit and each slice of pepperoni into four pieces. In a bowl, mix the cheese, pepperoni and remaining olive oil with the Italian seasoning. Transfer the mixture to the baking pan. Bake until the top is golden, about 30 minutes, checking the center for doneness before removing. Turn onto a serving plate and serve with sauce on the side for dipping.